Fossils found in East Africa suggest that protohumans roamed the area more than 20 million years ago. Recent finds near Kenya's Lake Turkana indicate that hominids lived in the area 2.6 million years ago. Cushitic-speaking people from what is now Sudan and Ethiopia moved into the area that is now Kenya beginning around 2000 BC. Arab traders began frequenting the Kenya coast around the first century AD. Kenya's proximity to the Arabian Peninsula invited colonization, and Arab and Persian settlements sprouted along the coast by the eighth century. During the first millennium AD, Nilotic and Bantu peoples moved into the region, and the latter now comprise two thirds of Kenya's population. The Swahili language, a Bantu language with significant Arabic vocabulary, developed as a trade language for the region. Arab dominance on the coast was interrupted for about 150 years following the arrival of the Portuguese in 1498. British exploration of East Africa in the mid-1800s eventually led to the establishment of Britain's East African Protectorate in 1895. The Protectorate promoted settlement of the fertile central highlands by Europeans, dispossessing the Kikuyu and others of their land. Some fertile and well watered parts of the Rift Valley inhabited by the Maasai and the western highlands inhabited by the Kalenjin were also handed over to European settlers. For other Kenyan communities, the British presence was slight, especially in the arid northern half of the country. 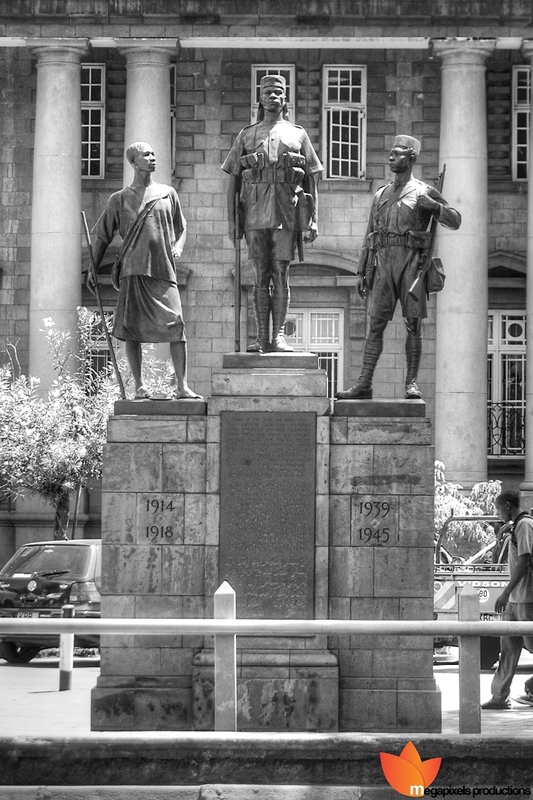 The settlers were allowed a voice in government even before Kenya was officially made a British colony in 1920, but Africans were prohibited from direct political participation until 1944 when a few appointed (but not elected) African representatives were permitted to sit in the legislature. From 1952 to 1959, Kenya was under a state of emergency arising from the "Mau Mau" insurgency against British colonial rule in general and its land policies in particular. This rebellion took place almost exclusively in the highlands of central Kenya among the Kikuyu people. Tens of thousands of Kikuyu died in the fighting or in the detention camps and restricted villages. British losses were about 650. During this period, African participation in the political process increased rapidly. The first direct elections for Africans to the Legislative Council took place in 1957. Kenya became independent on December 12, 1963, and the next year joined the Commonwealth. Jomo Kenyatta, an ethnic Kikuyu and head of the Kenya African National Union (KANU), became Kenya's first President. The minority party, Kenya African Democratic Union (KADU), representing a coalition of small ethnic groups that had feared dominance by larger ones, dissolved itself in 1964 and joined KANU. A small but significant leftist opposition party, the Kenya People's Union (KPU), was formed in 1966, led by Jaramogi Oginga Odinga, a former Vice President and Luo elder. The KPU was banned shortly thereafter, however, and its leader detained. KANU became Kenya's sole political party. At Kenyatta's death in August 1978, Vice President Daniel arap Moi, a Kalenjin from Rift Valley province, became interim President. By October of that year, Moi became President formally after he was elected head of KANU and designated its sole nominee for the presidential election. In June 1982, the National Assembly amended the constitution, making Kenya officially a one-party state. Two months later, young military officers in league with some opposition elements attempted to overthrow the government in a violent but ultimately unsuccessful coup. In response to street protests and donor pressure, Parliament repealed the one-party section of the constitution in December 1991. In 1992, independent Kenya's first multiparty elections were held. Divisions in the opposition contributed to Moi's retention of the presidency in 1992 and again in the 1997 election. Following the 1997 election Kenya experienced its first coalition government as KANU was forced to cobble together a majority by bringing into government a few minor parties. In October 2002, a coalition of opposition parties formed the National Rainbow Coalition (NARC). In December 2002, the NARC candidate, Mwai Kibaki, was elected the country's third President. President Kibaki received 62% of the vote, and NARC also won 59% of the parliamentary seats. Kibaki, a Kikuyu from Central province, had served as a Member of Parliament since Kenya's independence in 1963. He served in senior posts in both the Kenyatta and Moi governments, including Vice President and Finance Minister. In 2003, internal conflicts disrupted the NARC government, culminating in its defeat in 2005 in a referendum over the government's draft constitution. Two principal leaders of the movement to defeat the draft constitution, Raila Odinga and Kalonzo Musyoka, who are both former Kibaki allies, are now presidential candidates for the Orange Democratic Movement (ODM) party and the Orange Democratic Movement-Kenya (ODM-K) party, respectively. In September 2007, President Kibaki and his allies formed the coalition Party of National Unity (PNU). KANU joined the PNU coalition, although it serves in Parliament as the official opposition party. Kenya held controversial elections on presidential, parliamentary, and local government on December 27, 2007. Note: March 2008 – Kenya history is about to embark on a new era and is working on a power-sharing agreement between Mr Kibaki and Mr Odinga.